In the epic hip-hop Broadway musical Hamilton, there is a show-stopping number called “The Room Where It Happened,” that details a momentous backroom political deal that had long-lasting results. Over the course of my nearly year-long love affair with Hamilton, the title of the song has slipped into my lexicon to represent (sarcastically or otherwise) places where important things have occurred. Tonight–without sarcasm–I can honestly say that I returned to what is the most significant Room Where It Happened for me. Tonight marked the first time in nearly four years that I came back to the school auditorium at Saint Mary of the Angels in Chicago. From the outside and the inside, it looks like any other 50-plus-year-old Catholic school facility in the city–certainly not the kind of place where you would expect your life to change. But there I was tonight, in the same space where almost exactly four years ago (give or take two months), I met my wife. Four years ago, I was a 29-year-old bachelor showing up for an intermediate swing dancing class with a bunch of Catholic young adults. Looking back, I remember feeling a lot of uncertainty about my life at that point. I was drifting toward my fourth decade with doubts about what exactly I was supposed to be doing with myself. I had a picturesque life–a steady job, a college teaching gig, a nice condo, a great family and friends–but the vocation of marriage and family that I longed for and fully expected to already have achieved by that point would still gnaw at me in my weaker moments. I began to have doubts about what the future would look like. I trusted in God’s plan for me, but wondered if the blue prints I had drawn for myself didn’t actually match those of the architect. Faced with that conundrum, I guess I decided to sign up for my friend’s swing dancing class and look for pretty girls to date. Tonight I found myself back in the auditorium and once again surrounded by Catholic young adults, this time for a speaker event sponsored by the Catholic Young Professionals of Chicago. I’m sure I would have attended this event four years ago as well, in search of spiritual wisdom, but also pretty girls to date. Tonight, I came to the event as a 33-year-old married man who is about to become a father for the first time. Consequently, I was able to focus solely on the spiritual wisdom…and that sharpening of my focus was actually one of the points of the speaker’s talk. If you ever get the chance to hear Jeff Schiefelbein give a speech, make sure you take advantage of the opportunity. He is dynamic and inspiring and wise beyond his 38 years. His passion is contagious and I think I speak for many in the room when I say that his words left me wanting to be a better person and a better Catholic. The theme that stood out–and played right into the nostalgia of the location for me–was commitment. Jeff posited that when you fully commit yourself to something, it can be a challenge, but ultimately a freeing experience. Based on the ways my life has changed and the commitments I have undertaken in the intervening four years, I couldn’t agree more. By committing myself to Theresa for the rest of my life–and now bringing a new soul into the world to share in that commitment–I have freed up so much of the energy and attention that I was wasting on meaningless activities like forced relationships, physical and emotional insecurities, fears and doubts. The difficult and permanently binding commitments of marriage and fatherhood have given my life a purpose and fulfilled a vocation that were previously lacking. I am so grateful for the gift of this vocation, and the ways it has challenged me to become closer to being the person I always wanted to be. I know the refining process will continue as Theresa and I prepare to raise our daughter. I know there will be challenges that will sometimes make these commitments difficult to fully keep. But I also know that I have the focus and ambition to keep them–powers of self-mastery that I had not yet realized when I entered that auditorium four years ago. Jeff’s challenge to the audience tonight was to live a life that honors your commitment to your chosen vocation as well as to your faith…and to live authentically in a way that makes these choices visible to the world. I am well aware of my shortcomings in both of those categories, but I look forward to integrating his advice into my life and helping others that I encounter to understand and respect the commitments I have made, as well as to embrace their own commitments and experience the freedom with which I am now so richly blessed. This was my first Valentine’s Day with Theresa, a mere 8 days after we had officially started dating. (Awkward!) It was Ash Wednesday and I was teaching a night class, so we didn’t even see each other that day. We eventually celebrated Valentine’s Day the following weekend by going to dinner in Little Italy and swing dancing at Willowbrook Ballroom. The evening did not even end with our first kiss, as I got nervous and claimed to be disgustingly sweaty from all the dancing. How romantic! This was almost exactly one month before we got engaged. I was at Theresa’s apartment in the city for a casual night celebrating our one-year dating anniversary. I don’t remember what we had for dinner or even much of what we did, but I know that I made her a Shutterfly photo book of images from our first year of dating and she got me this awesome “It’s A Wonderful Life”-inspired sign that now hangs in our living room. Speaking of our living room, we were already in the process of buying our house and selling my condo. Things were getting serious. We spent that Valentine’s Day driving to Newburgh for her friend’s wedding and had dinner at a Bob Evans in Terre Haute, Indiana. How romantic! It was just one year later, but everything had changed. We had gotten engaged, gotten married, both got new jobs and now shared an address that neither of us had lived at just a year earlier. On February 13, however, we were not off toasting to our marital bliss somewhere. Instead, we were getting up early for my second chemotherapy appointment, which I was unable to receive due to my low white blood cell count. I eventually developed a neutropenic fever and we spent Valentine’s Day weekend living in the hospital for four days. How romantic! Another year, another lifetime. Cancer is behind us, but a baby on the way has ensured that there are new health-related adventures to be had. Today’s February 13th activities included Theresa taking a three-hour nap in the afternoon while I graded my students’ audio stories. She woke up from the nap feeling nauseous and spent the rest of the evening on the couch as we watched “Groundhog Day”–punctuated by her multiple nauseous trips to the bathroom. How romantic! Writing this brief travelogue of where we’ve been on this day for the past four years has shown me not only how much my life has changed and how quickly time has passed, but also assured me that Theresa is exactly the person I am meant to be with and that true love has absolutely nothing to do with romance–even on Valentine’s Day. Sure, swing dancing and movie signage are nice, but the love that we have expressed for each other in these first two years of marriage is so much deeper and more difficult to come by. Love is a complete commitment of trust, attention, affection and service toward another. Love is a willing sacrifice of your needs for the needs of your partner. Never is this definition of love more tangible than when you are spending the night on a couch bed in the hospital next to your husband or when you are sitting on the couch endlessly rubbing your wife’s as-yet-invisibly-pregnant-but-terribly-upset stomach to try to soothe her discomfort. Marital love has been on my mind a lot lately, and not just because Hallmark thinks I should buy a card and roses every February 14. Last weekend Theresa and I led our first Pre-Cana Catholic marriage preparation session. The day-long event brought 35 couples to our church’s basement to hear us drop some knowledge and facilitate the couples’ one-on-one discussions about how to have a successful and faith-filled marriage. It’s a long day brimming with potentially intense discussions, but looking around the room, it’s easy to see who is engaged (no pun intended) in the process and who is simply there so they can get the certificate that allows them to have their wedding in a church. Theresa and I talked openly about every aspect of our marriage–gathering anyone’s waning attention by strategically playing the cancer card and then the baby-on-the-way card at various points in the day. You can tell that Matt and Theresa really love each other. I was glad to hear that the couples recognized that just from the way we were leading the session, and I really hope that it inspired them to recommit themselves to the hard work of fully loving each other in a lasting way: sacrificing enough of themselves every day to honor their commitment to someone else. I’m not including all this to brag. I’m including it because I see it as a badge of honor that we have earned by consciously working for the good of our relationship through honesty, open communication and sacrifice. Does sacrificial love come particularly easily to us? Heck no. Are we somehow immune to the pressures of the world and the human insecurities that lead to conflict? Absolutely not. Do we fight? Of course we do. First thing this morning, actually. It’s impossible to go through chemo and morning sickness respectively without becoming irritable and/or irritating at various points in time. But we try to live in a way where love equals sacrifice, and we don’t move on from a disagreement until the equilibrium of our relationship has been restored. This morning’s fight ended with both of us acknowledging the points at which we had been idiots toward one another in the conversation. Humility, contrition and forgiveness are also difficult but essential aspects of sacrificial love. After we finished watching “Groundhog Day” tonight (which I incidentally once blogged about on my old blog! ), we watched a documentary called “112 Weddings,” about a longtime wedding videographer who revisits some of the couples whose weddings he filmed over the course of 20 years. As you might expect in today’s marital climate, the majority of the couples come across as rather unhappy when interviewed years later, which is made all the more compelling–and heartbreaking–when interwoven with images of their ecstatic joy on their wedding days. The documentary goes on to detail some of the personal trials and setbacks that led marriages to end in divorce or–more frequently among the couples interviewed–linger to this day in a listless or straight-up unhappy fog. I’m the first to admit that Theresa and I are incredibly blessed, and we are aware and thankful that our marriage itself is blessed by God who is guiding our every step and loves us with an even greater form of that same sacrificial love. But we are also two human beings with selfish needs and interests who have nevertheless decided to commit to one another and make it work–no matter what we might be facing together on a future February 13. Regardless of what that 1980s song says, life–not love–is a battlefield. Love is a commitment to go into battle alongside someone for whom you would willingly jump on a grenade to save. If you’re both doing it right, that person is already jumping on the grenade to save your life, too. Together, you can defuse the grenade and then try to come up with a better analogy. How romantic. Arguably one of the best scene-stealing screen characters in romantic comedy history is Ned Ryerson of 1993’s immortal (no pun intended) classicGroundhog Day. If you’re one of the few people left on Earth who has yet to see this nearly perfect film, you now have plans for the weekend. 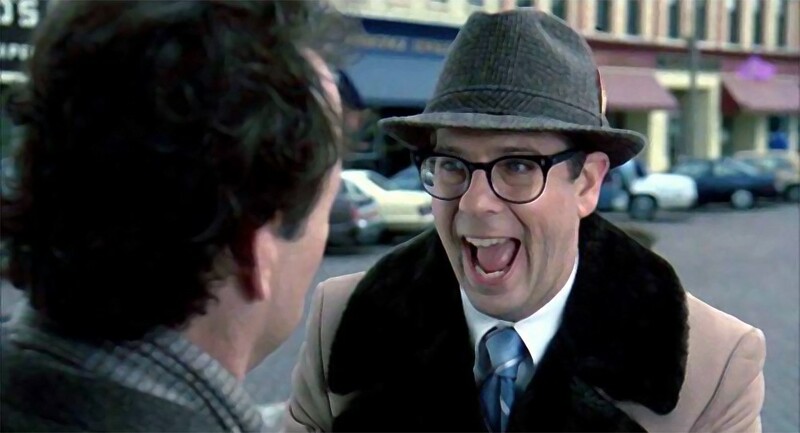 Now I never had the shingles, but that doesn’t stop me from sometimes feeling a lot like Ned Ryerson. That’s because I don’t really forget faces.